English School, mid-18th century, after John Payne (c. 1607-1648). 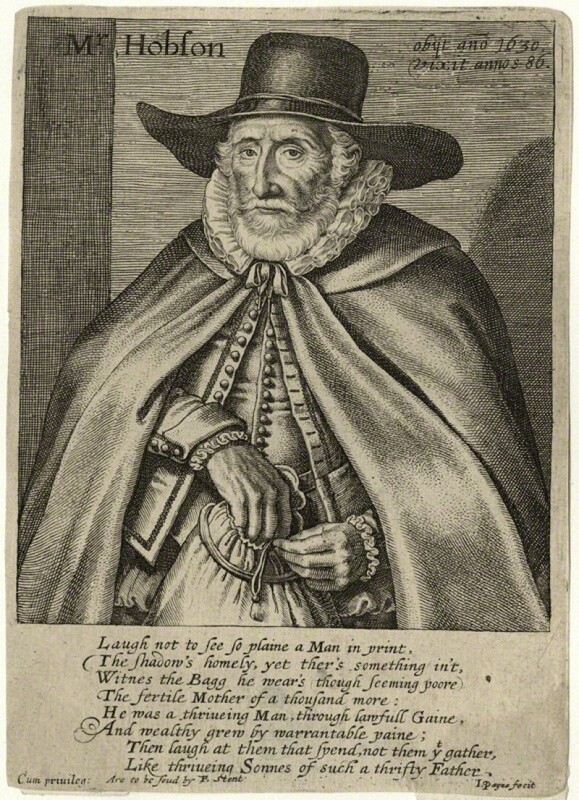 Portrait of Thomas Hobson (1544?-1631), half-length, the bearded elderly man in a broad-brimmed black hat, large ruff and cloak, holding a purse, within a feigned oval frame with identifying inscription ‘Mr. Hobson’ (upper left) and ‘obijt ano 1620 / Vixit annos / 86’ (upper right) and, on the purse ‘The fertile Mother of a Thousand More’, which is part of a well-known verse about Hobson. In an English mid-eighteenth century carved gilt-wood frame. A. Oswald, ‘Linley Hall, Shropshire - II, The Home of Mr. and Mrs. Jasper More’, Country Life, 14th September 1961, p. 559, illustrated in the Dining Room. And wealthy grew by warrantable paine’. 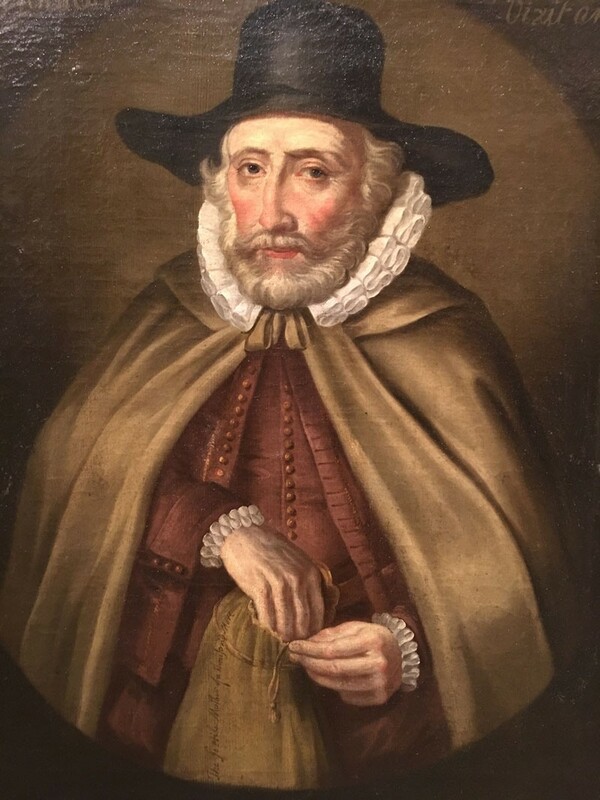 The National Portrait Gallery has another, similar, portrait of Hobson, by an unknown artist and dated 1629 (see Roy Strong, Tudor and Jacobean Portraits, 1969, p. 167; and David Saywell and Jacob Simon, Complete Illustrated Catalogue, National Portrait Gallery London, 2004, p. 305). It also has four prints of Thomas Hobson, which are the same image as this present portrait, with the same inscription. Two are by John Payne, and mid-17th century, two after Payne and dated late-18th or early 19th century. This present portrait is presumably mid-18th century, in its original frame, after Payne. 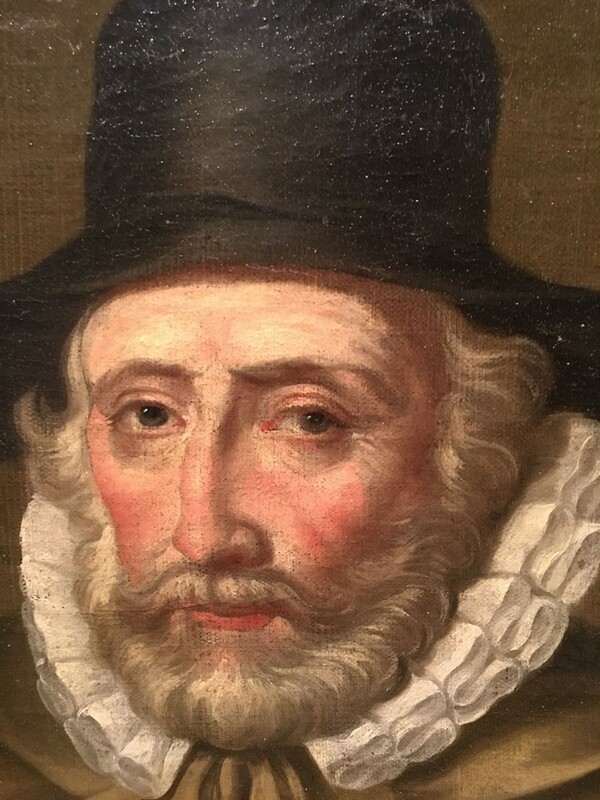 Curiously, the artist has made a mistake in the date at the top right, which is clearly 1620 in this portrait, but clearly 1630 in the Payne portrait.